1). They cost money. We don't have a lot of that to go around. 2). They are GLASS. With a handful of curious, learning, tiny children who are welcome to touch almost everything in the garden, a big glass bell seems like a--well, pretty HORRIBLE idea! We placed it over one of our cabbages (we were pleasantly surprised that three of our cabbages survived the bulk of the winter with no protection at all! 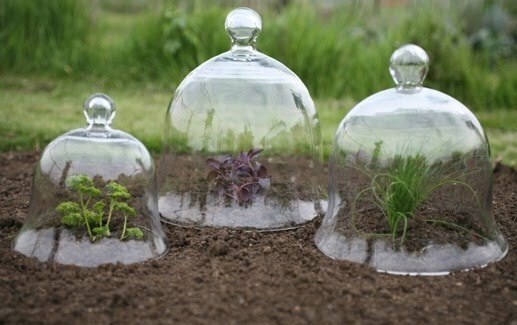 Adding a cloche was more of an experiment to see if it would help through the early spring). For good measure, Simon taped some bubble wrap around it. After monitering our cabbages for a few chilly weeks, and keeping the cloche on it (a couple of times we had to chase it down after a strong wind, once we had to completely replace it after a VERY strong wind), we saw that the protected cabbage was definitely bigger and more robust! What a great way to reuse plastic mik jugs! We are saving some up to use more extensively in the garden! 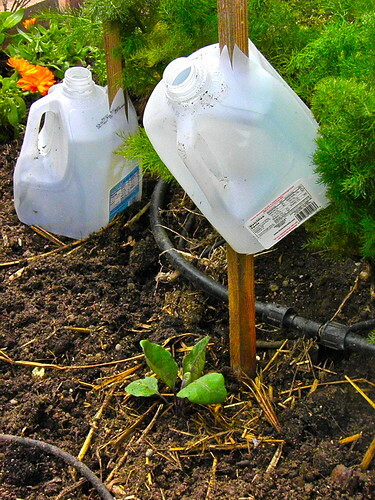 I later saw a picture online of a garden that used milk jugs with a stake through it, to hold it down and to allow the jug to be moved up and down on colder or warmer days. Genius! We will remember that idea.